If a film director is only as good as their last film, then I guess a software developer is only as good as their last software release. In more than 30 years of writing software professionally I have shipped my fair share of releases. For the last 13 years I have been shipping software as a solo developer. Here are a few things I have learned along the way. Some of them are specific to downloadable software, but some of them apply equally to SaaS products. I occasionally hear about software developers who don’t use a version control system. Instead they usually create some sort of janky system using dated copies of source folders or zip files. This send shivers down my spine. Don’t be that guy. A version control system should be an essential part of every professional software developer’s tool kit. It matters less which version control system you use. All the cool kids now use distributed version control systems, such as git. But I find that Subversion is fine for my requirements. This makes it easy to go back and compare any two releases. A bug appeared in the printing between v1.1.1 and v1.1.2? Go back and diff the source files related to printing and review all the changes. I store every binary I ship to customers in my version control system. Many people will tell you that you should only store the source in version control. Then you can use this to regenerate the binaries if you need to. This was sound advice back in the day when harddisks were small, networks were slow, version control systems were clunky (SourceSafe!) and developer environments didn’t change very frequently. But I don’t think it is valid advice now. Harddisks are as cheap as chips, networks are much faster and online updates mean your SDK, compiler or some other element of your toolchain is likely to be updated between your releases, making it impossible for you to recreate an identical release binary later on. In an analog system (such as a bridge) a tiny change in the system will usually only cause a small change in the behaviour. In a discrete system (such as software) a change to a single bit can make the difference between a solid release and a showstopper bug. The Mariner I rocket was destroyed by a single missing hyphen in the code. So test the binaries that you plan to ship to the customer. And if you change a single bit in the release, re-test it. You probably don’t need to run all the tests again. But you certainly can’t assume that a small change won’t cause a big problem. This issue often manifests itself when the developers test the debug version of their executable and then ship the release version. They then find that the two have different behaviour, e.g. due to a compiler optimization, different memory layout or code inside an ASSERT. As a corollary of the above, you need to be able to uniquely identify each executable. I do this by having a timestamp visible in the ‘About’ box (you can use __DATE__ and __TIME__ macros in C++ for this) and ensure that I rebuild this source file for every release. Do a quick diff of your new release files versus the previous ones. Have any of the files changed unexpectedly? Are any files missing? Try not to make major changes to your code or toolchain near a release. It is too risky and it means lots of extra testing. Sometimes it is better to ship a release with a minor bug than fix it near the release and risk causing a much worse problem that might not get detected in testing. Most of us have probably sent out a release that didn’t work on a customer’s machine due to a missing dynamic library. Oops. Make sure you test your release on a non-development machine. VMs are useful for this. Don’t expect customers to be very impressed when you tell them ‘It works on my machine‘. At least run a smoke test on the oldest and most recent version of each operating system you support. Use unit tests and test harnesses to automate testing where practical. For example I can build a command line version of the seating optimization engine for my table plan software and run it on hundreds of sample seating plans overnight, to test changes haven’t broken anything. If you set up a continuous integration server you can build a release and test it daily or even every commit. You can then quickly spot issues as soon as they appear. This makes bug fixing a lot easier than trying to work out what went wrong weeks down the line. Automated test won’t pick up everything, especially with graphical user interface issues. So you still need to do manual testing. I find it is very useful to see real-time path coverage data during testing, for which I use Coverage Validator. You can’t properly test your own software or proof read your own documentation any more than you can tickle yourself. So try to get other people involved. I have found that it is sometimes useful to pay testing companies to do additional testing. But I always do this in addition to (not instead of) my own testing. Your documentation is an important part of the release. So make sure you get it proof read by someone different to the person that wrote it. Even two computers with the same hardware specifications and operating system can be set up with an almost infinite range of user options (e.g. screen resolutions, mouse and language settings) and third party software (e.g. anti-virus). Getting customers involved in beta testing means you can cover a much wider range of setups. When I am putting out a major new release I invite customers to join a beta mailing list and email them each time there is a new version they can test. In the past I have offered free upgrades to the customers who found the most bugs. I believe in a defence in depth approach to QA. Testing is just one element. Typically a release process involves quite a few steps: building the executable, copying files, building the installer, adding a digital signature etc. Write a script to automate as much of this as possible. This saves time and reduces the likelihood of errors. There are typically lots of tasks that can’t be automated, such as writing release notes, updating the online FAQ, writing a newsletter etc. Create a comprehensive checklist that covers all these tasks and go through it every release. Whenever you make a mistake, add an item to the checklist to catch it next time. Here is a delightfully meta checklist for checklists. Customers are entitled to know what changes are in a release before they decide whether to install it. So write some release notes describing the changes. Use screen captures and/or videos, where appropriate, to break up the text. Release notes can also be very useful for yourself later on. Whenever I record a customer bug report or a feature request, I also record the email of the customer. I then email them when there is a release with a fix. It seems only polite when they have taken the effort to contact me. But it also encourages them to report bugs and suggest features in future. I will also let them access the release before I make it public, so they can let me know if there are any problems with the fix that I might not have spotted. Don’t force customers to upgrade if I don’t want to. And don’t nag them every day if they don’t. A case in point is Skype. It has (predictably) turned from a great piece of software into a piece of crap now that Microsoft have purchased it. Every release is worst than the last. And, to add insult to injury, it just keeps bleating at me to upgrade and there doesn’t seem to be any way to turn off the notifications. Neither are good. So don’t promise ship dates. I never do and it makes my life a lot less stressful. It’s ready when it’s ready. I realize that some companies with investors, business partners and large marketing departments don’t have that luxury. I’m just glad that I am not them. There isn’t much point in putting out releases if no-one knows about them. By default my software checks an XML file on my server weekly and informs the customer if a new update is available. I also send out a newsletter with each software release. I generally get a spike in upgrades after each newsletter. Creating a stable release is a lot of work, even if you manage to automate some of it. The more releases you do, the higher percentage of your time you will spend testing, proof reading and updating your website. Adobe Acrobat seems to go through phases of nagging at me almost daily for updates. Do I think “Wow, I am so happy that those Adobe engineers keep putting out releases of their useful free software”? No. I hate them for it. If you have an early stage product with early-adopters, they may be ok with an update every few days. But most mainstream customers won’t thank you for it. Fixing a bug or usability issue doesn’t help the customer until you ship it. Also a product with very infrequent updates looks dead. The appropriate release frequency will vary with the type of product and how complex and mature it is. Digital certificates are a rip-off. But unsigned software makes you look like an an amateur. I am wary of downloading any software that isn’t digitally signed. Apple now prevents you downloading unsigned software by default. 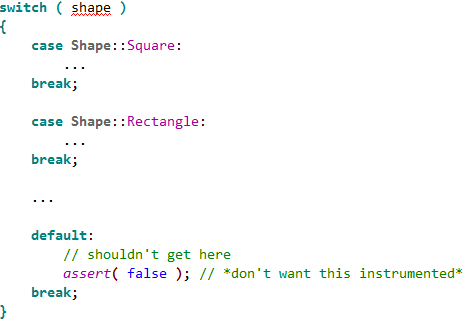 Signing is just an extra line in your build script. It is a bit tedious getting a digital certificate though, so get one that lasts several years. Over zealous anti-virus software can be a real headache for developers of downloadable software. So it is worth checking if your release is likely to get flagged. You can do this using free online resource virustotal.com. If you are flagged, contact the vendor and ask them to whitelist you. Beware second system effect. If you wait for perfection, then you will never ship anything. As long as this release is a significant improvement on the last release, then it is good enough to ship. I’ve led a few dozen major software releases in my life. And one might think that by now I’d have got to the point where doing a software release would just be a calm and straightforward process. But it never is. Perhaps it’s because we’re always trying to do majorly new and innovative things. Or perhaps it’s just the nature of such projects. But I’ve found that to get the project done to the quality level I want always requires a remarkable degree of personal intensity. Yes, at least in the case of our company, there are always extremely talented people working on the project. But somehow there are always things to do that nobody expected, and it takes a lot of energy, focus and pushing to get them all together. So look after yourself. Make sure you get enough sleep, exercise and eat healthily. Also things may be at their most intense straight after the release with promotion, support, bug fixing etc. So it may be a good idea to take a day or two off before you send the release out. There is always a chance a new release is going to mess things up. If you are a one-man band like me, you really don’t want to make a software release just before you go away on holiday or to a conference. Wait until you get back! We all make mistakes from time to time. I recently put out a release of my card planning software, Hyper Plan, that crashed on start-up on some older versions of macOS. Oops. But I got out a release with a fix as soon as I could. Releases are hard work. A successful release deserves a treat! This entry was posted in article, QA, software and tagged binaries, saas, shipping, software, software release, testing, version control on 17 April 2018 by Andy Brice. The blog is being sponsored this month by TestLab², a software testing and QA company based in the Ukraine. I have used TestLab² on a number of occasions for third party testing of PerfectTablePlan releases on both Windows and Mac OS X. They found a number of bugs that I hadn’t been able to find on my own (testing your own software is always problematic) and gave me additional confidence that I hadn’t let any embarrassing bugs make it through into the final binaries. Their prices are very reasonable (from $20/hour) and I have always found them to be very professional and responsive (see my previous write-up on outsourcing testing). They also have access to operating systems that I don’t have set-up, e.g. Windows 8 and Mac OS X 10.8. Quote “successful software” when you ask for an estimate and they will give you a 20% discount. This offer is valid for first-time customers, for the next 14 days only. This entry was posted in QA, software and tagged promotion, QA, testing, testlab2 on 1 March 2012 by Andy Brice. It only took me a few minutes from downloading to getting results. And the results are a lot less noisy than lint. I’m impressed. PerfectTablePlan is heavily tested and I don’t think any of the issues found are the cause of bugs in PerfectTablePlan, but it shows the potential of the tool. The documentation is here. But, on Windows, you just need to start the Cppcheck GUI (in C:\Program files\Cppcheck, they appear to be too modest to add a shortcut to your desktop), select Check>Directory… and browse to the source directory you want to check. Any issues found will then be displayed. You can also set an editor to integrate with, in Edit>Preferences>Applications. Double clicking on an issue will then display the appropriate line in your editor of choice. 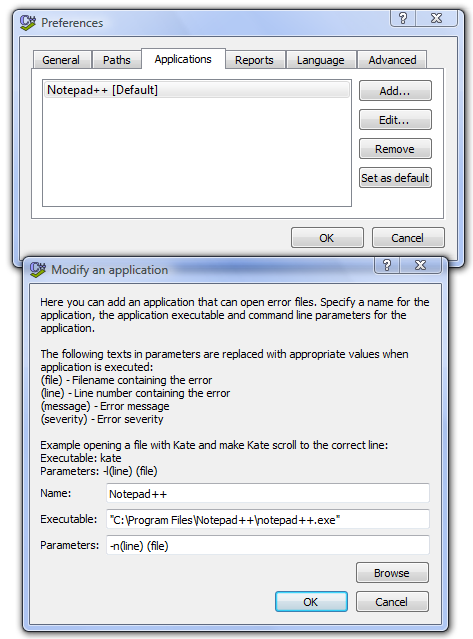 Cppdepend is available with a GUI on Windows and as a command line tool on a range of platforms. There is also an Eclipse plugin. See the sourceforge page for details on platforms and IDEs supported. You can even write your own Cppcheck rules. Cppcheck could be a very valuable additional layer in my defence in depth approach to QA. I have added it to my checklist of things to do before each new release. This entry was posted in C++, QA, reviews, software, tools and tagged C++, Cppcheck, free, QA, software, static analysis, tool on 29 November 2011 by Andy Brice. Every time I write a post for this blog I carefully check it for typos. I then get my wife to proof-read it. She always finds at least one typo. Often there will be whole words missing that my brain must have interpolated when I checked it. I read what I thought I had written. She is unencumbered by such preconceptions. Similarly, it isn’t sufficient to do all your own testing on software you wrote, no matter how hard you try. You will tend to see what you intended to program, not what you actually programmed. Furthermore your users have different experiences, assumptions, and patterns of usage to you. Even in the unlikely event that you manage 100% code coverage in your testing, those pesky users won’t execute those lines of code in the same order you did. I have spent hours testing a program without finding a bug, only to see someone else break it within minutes or even seconds. It is haphazard. I never hear from ~90% of my beta testers. The quality of bug reports from customers is often poor. Customers often don’t understand (or don’t have the patience) to describe a bug in enough detail for you to reproduce it. Professional testers know how to break software. The new release should be as polished as possible before any customers see it. Your beta testers will be some of your most enthusiastic customers. You don’t want to use up that goodwill by sending them buggy software. The problem with paying a testing company is that it is hard to assess the quality of their work until it is too late. If they report few bugs it could because there are few bugs or because they didn’t do a very good job of testing. By using 2 companies to test the same software release I was also testing the testers (I didn’t tell them this). I paid each company to do approximately 3 days testing on the Windows and Mac versions of PerfectTablePlan. I was very pleased with the results. Both companies found a useful number of bugs in the software. They were also able to test on platforms that I didn’t have access to at the time (64 bit Windows 7 and Mac OS X 10.6). I didn’t keep an exact score, but I would say that QSG found more bugs, while TestLab2 was more responsive. QSG found some quite obscure bugs. They were even able to tell me how to reproduce a very rare and obscure bug that I had been trying to track down for months without success. Communications were sometimes a little slow (at least partly due to us being in different time zones) but it wasn’t a huge issue. My only real grumble is their billing. Despite several reminder emails from me I am still waiting to be invoiced for the work several months later. I like to pay my bills promptly and then forget about them. TestLab2 didn’t find quite as many bugs, but I was impressed with their responsiveness. They installed Mac OS X 10.6 within a few days of it being released, so they could test PerfectTablePlan on it. When I emailed them on a Saturday about a last minute bug fix for Mac OS X 10.6 they tested the fix the same day. That is great service. TestLab2 and QSG are based in Ukraine and India, respectively. At around $15/hour they are about a third the price of equivalent US/European companies I contacted (who might also outsource the work to Eastern Europe and India, for all I know). Some people believe outsourcing work to countries with lower costs of living is evil. I’m not one of them. I sell my software worldwide and I am also happy to buy my services worldwide, especially if I can get significantly better value for money by doing so. While there are rational arguments to be made about problems caused by differences in culture, language and time zone caused by outsourcing to other countries, I didn’t find any of these to be a major issue in this case. Most of the other arguments I have heard boil down to the simple ugly fact that some westerners feel they are entitled to a disproportionate share of the global pie. But I don’t see any reason why someone in Europe or North America is any more deserving of a job than someone in Ukraine or India. With the help of these two companies I was able to put out a really solid PerfectTablePlan v4.1.0 release, despite the large number of new features. In fact, I am only just putting out a v4.1.1 with some bugs fixes several months later. I plan to use both companies again. I hope readers of this blog will give them some additional work to ensure they stay in business. But not so much that they don’t have time to do my next round of testing! This entry was posted in article, microISV, QA, software and tagged offshoring, outsourcing, QA, qsgsoft, software, testing, testlab2, third party on 9 December 2009 by Andy Brice.